Your Audience Manager tab holds a wealth of information about your subscribers. Here is a quick walk-through of your subscriber list viewing and editing options. Name - edit the name by selecting the pencil icon to the right of the subscriber's name. Email - edit the email by selecting the pencil icon to the left of the subscriber's email (hint: the key identifier for their Cerkl profile). 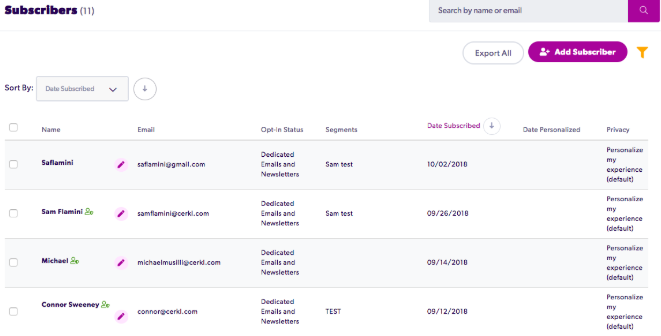 Opt-In Status - shows what aspect of your content your users have opted into (i.e Dedicated Emails, Newsletters, or both), or, if they have unsubscribed or you have blocked them, it will denote "unsubscribed," or "unsubscribed and blocked." Segment - what segment(s) that subscriber is assigned to. You can sort by specific segment by selecting from the "Segment" dropdown menu. Date Subscribed - the date when the subscriber was added as a subscriber of your Cerkl newsletter. Date Personalized - the date that the user identified their preferences (if there is no date, this means that the user has not personalized explicitly through the welcome email. But no worries, even if they haven't, they will still receive personalized content as Cerkl gets to know them). Privacy - what users have told you that they want as their privacy settings, either "personalize my experience" (the default), "personalize my experience but do not report on my activity," or "do not personalize my experience." Update Segments - You can add the selected subscriber to a segment or remove the selected subscriber from a segment. Set Privacy - You can set the privacy settings for the selected subscriber, either "personalize my experience" (the default setting), "personalize my experience but do not report on my activity," or "do not personalize my experience." Opt-In Status - Use this button to set the opt-in status for a subscriber. Designate whether you want your subscribers to see the Newsletter, Dedicated Emails, or both. You can also unsubscribe or unsubscribe and block a user with this button.